When did you know you wanted to make innovation a focal point in your life? I think I've always been a pretty creative person. My mom is an artist and I grew up with her making all of these creative things: paintings, drawings, tapestries, sculptures. Living with an artist mom was a bit chaotic, but really fun. I had her as an example of how working at something makes you better at it - creates mastery. So when my family got a Commodore 64, sometime when I was around 9 or 10 years old, it totally made sense to me that I would learn how to write computer programs. I wanted to master that skill. I'm still a big believer in mastery-based learning; everything we do at Hatch is built around that. What made you want to teach computer programming to kids? I wanted to give kids the same opportunities to learn and explore that I had growing up - and to have them realize that by practicing the art of computer programming, they can master it. How is Hatch Coding innovative? That's a great question. I guess it just came out of my imagination from a place that thought "I don't see this anywhere else"; I wanted to create what was in my own imagination. So I decided to start Hatch with my wife, Emmanuelle Deaton, so that kids would have an online learning environment - web-based software - where they could practice skills and be innovative at the same time. The software that I envisioned was to let kids realize what is in their own imaginations. 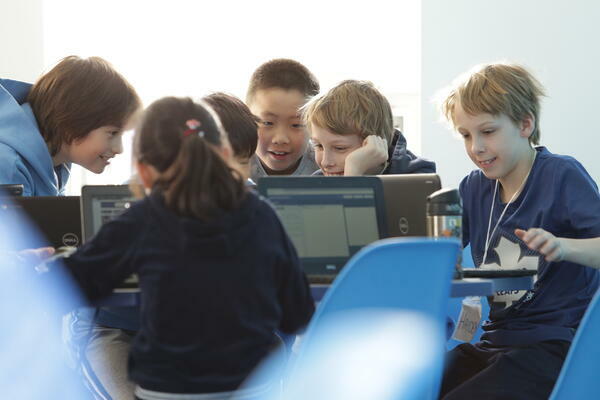 Ultimately, the platform allows computing immersion: kids do project-based learning and master skills as the work on computer programs. Why did you start Hatch in Toronto? I love Toronto! It's my hometown and I love giving back to it.I did enjoy conceptualizing Hatch with friends outside of the city though.